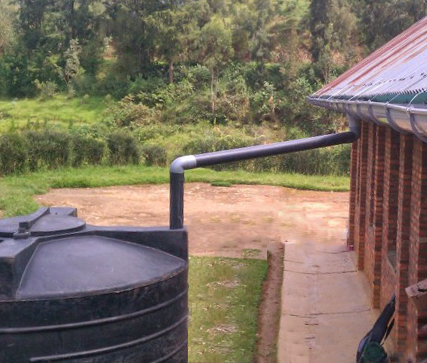 Rainwater harvesting is a common practice in tropical locations around the world. Ocean Caraibes has experience with both small and large projects related to home owners, businesses and farming. run-off, erosion, and contamination of other water sources. Ocean Caraibes can help you capture and sustain fresh water in a variety of efficient ways. Perhaps the oldest method of harvesting fresh rain water is utilizing the broad, sloped surface of any roof (the collector). When it rains, water falls on the roof, runs down to a gutter channel placed directly under the bottom edge of the roof, into a gutter, then into down spout pipe that drains the water into a storage catchment... a barrel, tank, cistern, pond -- anything suitable for retention. For example, a pitched roof area measuring 40 ft x 48 ft potentially can collect 400 gallons a day during a light rain or 1500 gallons in a few hours (or less) during moderate rainfalls and much much more during heavy rainfall periods. ​A rule of thumb calculation for square footage per amount collected is about 400 gallons of water per 1 inch of rainfall. This method consists of a permeable surface underlain by a uniformly-graded stone bed. Rainwater drains through the surface, is temporarily held in the empty spaces of the stone bed, then drains into the underlying soil mantle or is controlled by strategically placed channels where it drains into suitable storage. Asphalt / concrete - Fine particles are left out of the mix to make it more porous. 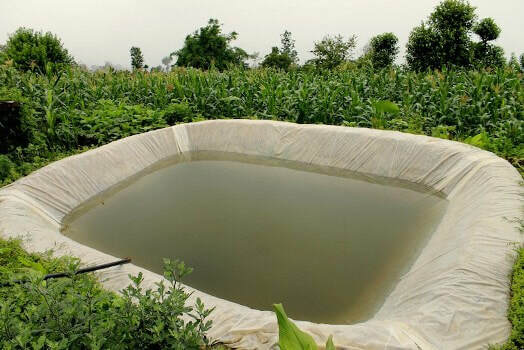 Storage Ponds - given the availability of basically flat or gentle sloping land... at a reasonable cost this option merits consideration. Simple in design, a pond, created by removing earth to make basin, and or the placement of an earthen or concrete dam, is placed at a strategic location along a natural slope or drainage area. When it rains, water, channeled by the natural terrain slope and or terraces, empties into the pond. our most important natural resource. Catchment Reservoirs - generally require more land than a water storage pond. However, catchment systems can be designed / constructed on the sides of a mountains, cliffs and hillsides which are not suitable for farming or commercial development. Consequently, land cost is usually less than for that of a storage pond. The main advantage of a water catchment reservoir system is that it is low tech, requires almost no maintenance and is very cost efficient. This method keeps it as simple as possible!